On November 18, 2014, The Black Women's Movement in Defense of Life and the Ancestral Territories -- black women from the Northern Cauca region of Colombia -- began a multi-day march from their homes to the urban city of Cali. The march was both a protest and an act of defiance: they were marching to demand rights to their ancestral homelands, which are currently under eminent threat. This week we begin to explore the transnational elements of our class by taking a look at black women's struggles in Colombia. No where do these struggles become more salient than in the context of the land rights movement in Colombia. Colombia has the third largest African descendant population in the world after Nigeria and Brazil. Africans began arriving in the territory that would become Colombia in the 16th century. 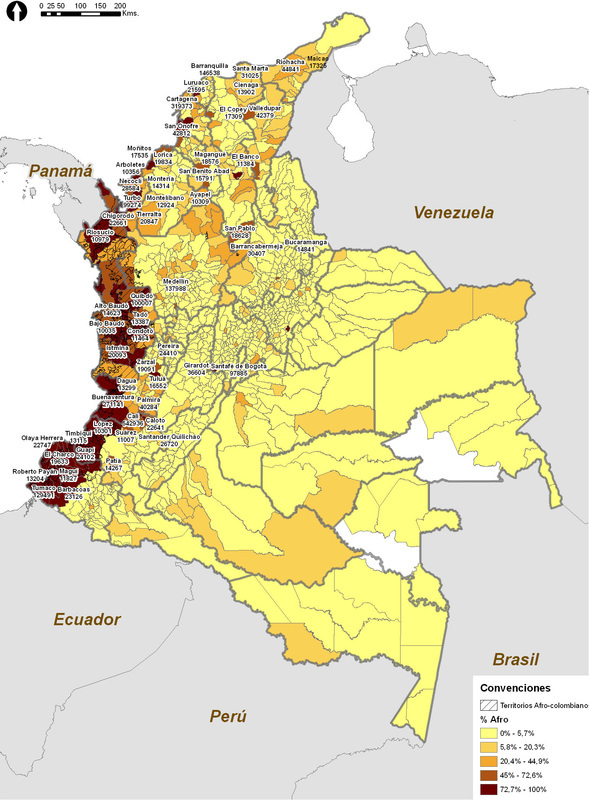 Like most other regions of Latin America of this time, the region of Colombia was dependent on enslaved African labor in the 17th and 18th centuries. Enslaved Africans worked in the areas of "mining, agriculture, cattle raising, commerce, pearl fishing, domestic work and craft production", but mining was their principle trade (Minority Rights Group 1995:48). In addition to the Africans who were enslaved, there were also Spanish Africans who migrated to Colombia who were descendants of soldiers and Africans who had settled in the Iberian peninsula. Today, most of the Afro-Colombian region is concentrated in the western coastal area (see map below). One of the primary challenges facing the Afro-Colombian community today is the issue of land rights. Illegal miners, often tied to multinational corporations, seeks to remove Afro-Colombians from their ancestral homelands, which are rich in minerals and natural resources. This process of removing Afro-Colombians from their homeland often entails violence and intimidation. In response, the Afro-Colombian community has been fighting for land and human rights locally, nationally and transnationally. On Thursday we have the pleasure of receiving a special guest in our class. Danelly Estupiñán is an Afro-Colombian activist and community organizer from the Proceso de Comunidades Negras (Black Communities Process, PCN). She is the coordinator of the human rights program for PCN's Palenque el Congal, which works in the rural and urban areas of Buenaventura in southwestern Colombia. For nearly two decades, Ms. Estupiñán's work primarily with women has provided psychosocial support for victims of violence and defended the collective rights of black communities in the region. She has a degree in sociology and is pursuing her MA in political science. Human Rights Watch's page on Afro-Colombians. This week we are talking about Assata Shakur and her revolutionary life story. Specifically, we ask the question: How did a black woman, political activist, mother and grandmother become the first woman ever put on the FBI's Most Wanted Terrorist list and why? What are the hidden gender, race and class politics around this story and how can we begin to unpack them? What are the implications of her story for black women in the United States and elsewhere? We will begin our discussion by talking about her life, her involvement with the Black Liberation Movement in the United States and her exile in Cuba. What is it about this black woman revolutionary that makes her such a threat to our national and international order? This is the blog page for the course Black Women, Struggle and the Transnational State at UT Austin. All thoughts are our own and should not be borrowed or re-printed without prior permission.